Care Forum Wales's Sue Thomas has been recognised for her work in organising and promoting the Wales Care Awards. Sue is due to have tea with the Queen at a Royal tea party at Buckingham Palace on May 28. She was nominated by Wrexham AM Lesley Griffiths for her tireless enthusiasm, organisation and hard work in support of the Awards over the years since they first began in 2003. Sue began work at Pendine Park care organisation as an admin clerk more than a decade ago and five years ago was promoted to Personal Assistant to proprietor Mario Kreft MBE. As part of her duties Sue took on the role of chief administrator for Care Forum Wales including organising the Wales Care Awards. 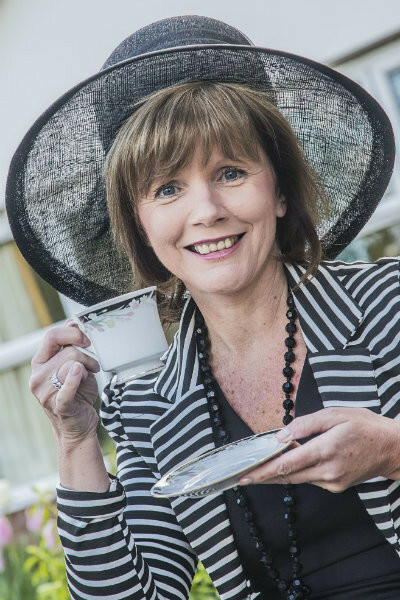 Sue, pictured, says she was left speechless after discovering her work with Care Forum Wales had led to the invitation to the Buckingham Palace garden tea party with the Queen. She said: “I was absolutely thrilled, surprised and delighted. I have never been invited to anything remotely similar before. It really is amazing. "I have to thank Wrexham AM and Welsh Government Minister for Communities and Tackling Poverty, Lesley Griffiths AM for nominating me. It’s a real honour and I will be representing everyone connected with Care Forum Wales as well as Pendine Park Care Organisation. "It’s really humbling Lesley Griffiths took the time to nominate me. She has always been a huge supporter of Care Forum Wales and Pendine Park." Sue added: "Care Forum Wales works hard to raise the profile and celebrate the hard work and dedication of the social care workforce. My job is to co-ordinate and organise the event and raise sponsorship where I can. "It’s a year-round job collating the information and collecting nominations. We normally receive around 300 nominations for the 22 awards. An independent panel then goes through the nominations and an initial shortlist of six nominees is prepared. This is then reduced to three nominees who attend the awards ceremony which is usually held in October in Cardiff City Hall. "It’s a wonderful occasion which, quite rightly, celebrates the excellent work that often goes un-noticed by the general public. We are really very lucky because we have some wonderful sponsors and I am eternally grateful to them because the Wales Care Awards simply wouldn't happen without their generosity." Wrexham AM Lesley Griffiths, who nominated Sue Thomas, said: "Pendine Park is a fantastic organisation and a leading social care provider in our community. Without the hard work and dedication of the staff, Pendine Park would not have been able to achieve their highly respected reputation. "Sue personifies the excellent care and expertise the organisation provides and is a shining example of the exceptional people who care for the most vulnerable in our society. "In addition to her work at Pendine Park, Sue is also a chief administrator of Care Forum Wales. Representing hundreds of care homes and social care providers across the country, Sue’s work aims to promote partnership and improve and advance the social care sector across Wales. "I am delighted her nomination has been successful and I am sure Sue, along with her husband Darren, will have a wonderful day at Buckingham Palace."